What is a Cuban Paladar? If Cuba isn’t already on your list for upcoming travels, I couldn’t recommend it more! Now that we got that out of the way, let’s talk about Cuban restaurants – or Paladares. While the word, “Paladar” is of Spanish origin meaning “palate”, in Cuba the term exclusively refers to restaurants that are individually owned by Cuban people as opposed to the traditional government-operated restaurants. A brief history of the Cuban Paladar: in Spain many years ago a woman decided to open a restaurant out of her home. She chose the fitting name, “Paladar” and in 1990 when the fall of the USSR and economic crisis fell onto Cuba, the government was forced to make economic reforms. One of those reforms was legalizing small, privately own businesses as restaurants. Because many Cuban are not allowed to own property, they began to open these private businesses out of their own homes and adopted the name “Paladar”. One of the most well-know Paladares in Havana is La Guardia (pronounced: “l-uh-g-w-AH-r-d-ee-uh”). I had the opportunity to enjoy an absolutely delicious dinner here during my recent travels to Cuba. While the entrance is completely unassuming, upon walking 4 flights of stairs we arrived at a beautiful rooftop restaurant, overlooking all of Havana. 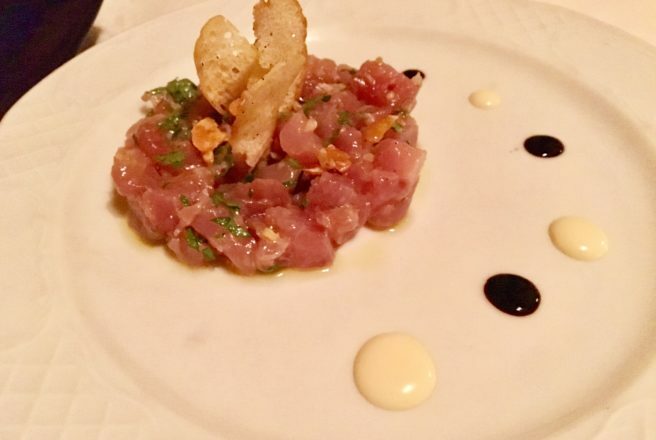 In the main photo, I chose to feature their Tuna Tartar which was complimented by dollops of Cumin Mayo and Soy Sauce. Believe it or not, spices aren’t really available in Cuba but cumin is one of the most common in Cuban cooking. La Guardia is also the only restaurant where the chefs plate their food like art. Besides the Tuna Tartare, my second favorite dish was the Green Ceviche, which was only served at the bar. The fish and shrimp was marinaded in a parsley-pesto & olive oil, topped with shaved vinegar onion, juicy tomatoes and potato chips.